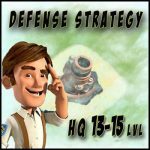 Best defense base layout HQ 9,10,11,12 | Boom Beach. All about the Game! ← VP dropping. Does it make any sense? Poll. 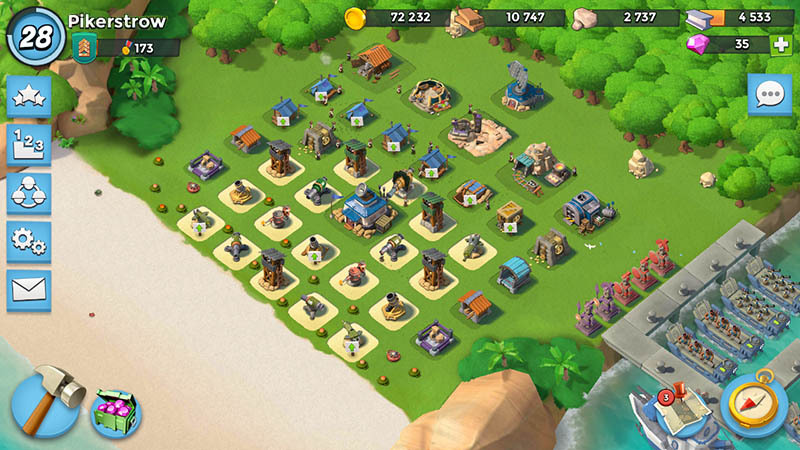 It is impossible to build an invincible defense in the Boom Beach. It’s an axiom. And no matter how you place buildings there always will be a player who will find the way how to overcome your defense. But despite of this I don’t recommend to place buildings somehow. We should try to place all defensive buildings in such a way that allows reducing the number of enemy successful attacks to the minimum. Because the good arranged defense allows earning an extra diamonds and intels for destroyed enemy units. 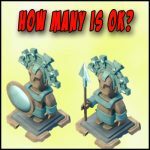 Of course there is the category of players that are focused only on attacks in Boom Beach and they don’t care about defense at all… but in that case is fully different game strategy (you can read about such strategy here). In this post I’ve described to my mind the best defense layouts for bases with HQ from 9 to 12 levels (optimal defense layouts for HQ 5-8 lvl are here). Place on the first line a few of civil buildings in order to divert of enemy troops attention on their destruction. Do not place defensive buildings tightly each to other because in such position they are very vulnerable for enemy artillery. In such position, one artillery hit in the conjunction of two or more buildings causes damage for all buildings. 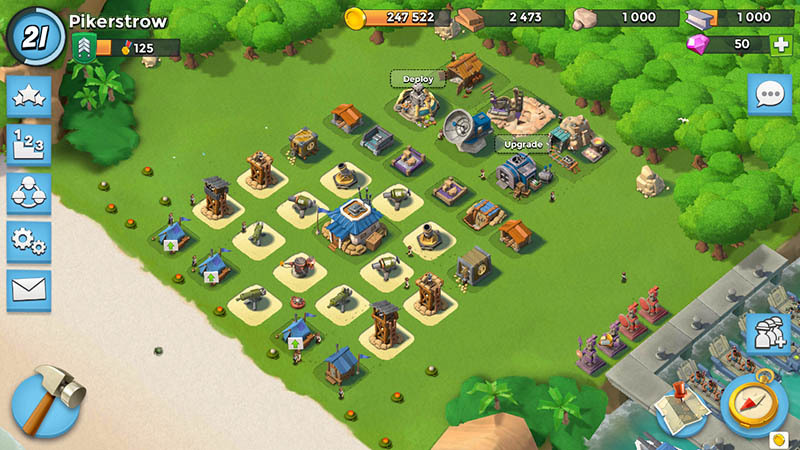 Try to place every building on the island in the radius of attack of at least of one defensive weapon. 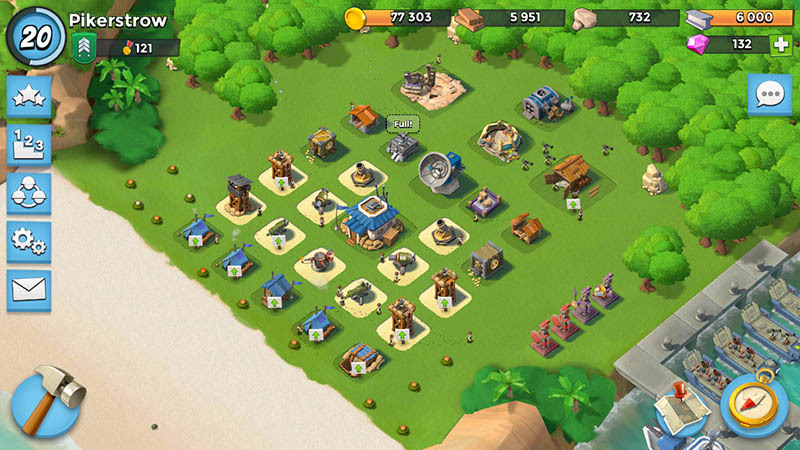 After reaching the Headquarters level 10 the quantity of available defensive buildings in the Boom Beach increases on 2 units: opens one more Cannon and one more Machine Gun. 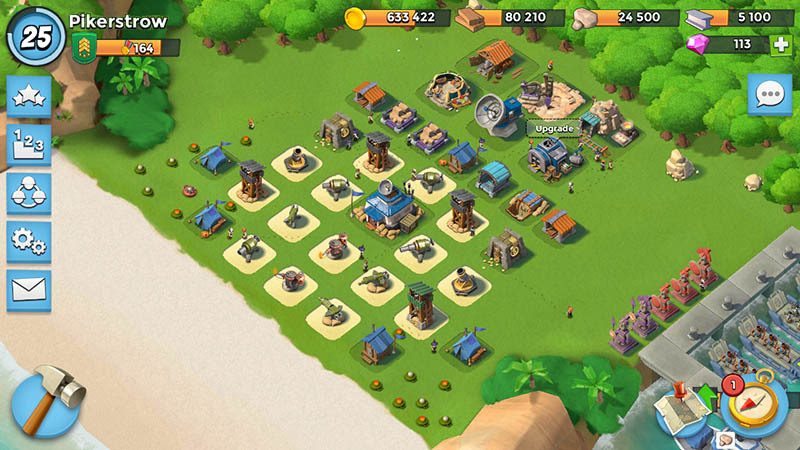 In general 13 units of defensive buildings are available on that level of the game: 3 Cannons, 4 Sniper Towers, 3 Machine Guns, 2 Mortars and 1 Flamethrower. 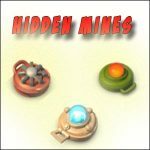 From non-defensive building becomes available the Iron Mine and the Stone Storage. The principles to be followed are the same. The only weak point of such position is an opportunity of freely attack the Base from the rear. But the probability of such attack is very low on the early stages of the game due to unavailable Smoke Screen. At the 11 level of Headquarters from the defensive buildings opens one more Cannon and one More Flamethrower. Thus we have available 4 Sniper Towers, 2 Mortars, 4 Cannons, 3 Machine Guns and 2 Flamethrowers. From the economical types of buildings opens only one more Residence. As you can see from the picture, I placed two Residences on each flank of the defense. The main purpose of these building is diverting of enemy troops attention on their destruction. Also, due to the fact that flanks are the most vulnerable point they are firmly reinforced with mines. 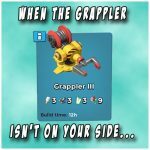 In the Boom Beach after upgrading the Headquarters to level 12 from the defensive buildings opens one Doom Cannon, one more Mortar and one more Sniper Tower. From the non-defensive buildings we can place one more Gold Storage. Thus total amount of available buildings is 39 (include the Headquarters). P.S. I would also like to note that very big influence on the defense has the presence of “blue” statues the main purpose of which is increasing of buildings health or increasing of defensive buildings damage. But place them or not everyone decides for itself. For HQ lv 11, is it okay to put two flamethrowers beside the HQ? thanks for the helpful advice I hope to see you in boom beech if I can. Can they go to the jungle and smash the base on HQ level 9? This helped a lot! Was wondering on good base layouts and this helped!